A Wright State graduate might soon add an Oscar to her trophy case. 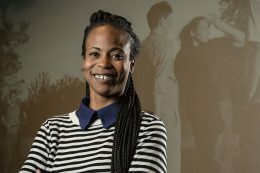 Hannah Beachler, a Centerville-raised graduate of that university’s film and production design program, has been nominated for the Production Design Academy Award for her work on the blockbuster Marvel movie “Black Panther.” She shares the nomination with Jay Hart. Beachler managed a reported $30 million budget for “Black Panther” and was the first woman to work for Marvel as a production designer. She is also the first black woman to be nominated for a best production design Oscar. Read the article from Dayton.com.